The Buffalo Turbine Dust Controller line features the revolutionary industry first turbine driven Gyratory Atomizing Nozzle. Simply connect to a common 3/4″ garden hose with standard municipal water pressure and harness the power of a legendary Buffalo Turbine blower to effectively control job-site dust, odor and smoke at a fraction of the cost compared to machines that use spray nozzle tips. Mist suppression is one of the best methods for controlling dust. By creating a wall of micron size atomized fluid (commonly water) droplets, fugitive airborne pollutants bond to it, then instantly become heavier and safely drop to the ground. Until the introduction of Buffalo Turbines’ Dust Controller Gyratory Atomizing Nozzle, dust control was accomplished by costly, complicated, high maintenance spray nozzles and bulky fans commonly used for making fog or snow. Offering even more value, the Gyratory Atomizing Nozzle can be powered by your choice of gas, electric, hydraulic or pto. Spray direction can be changed with remote 360 degree nozzle control for non-electric models and available 0, 45 and 90 degree elbow segments. Best of all, its compact size, ability to adjust water volume from 0 to 20 gallons per minute, and interchangeable mounting options make the Buffalo Turbine Dust Controller misting system portable and versatile between varying job-site environments. Dust and Odor from demolition, recycling and waste sites can create potential health hazards for workers and the surrounding community. With air quality a primary environmental concern, many government agencies and local municipalities enforce clean air regulations. The Buffalo Turbine Dust Controller simplifies Dust Control. 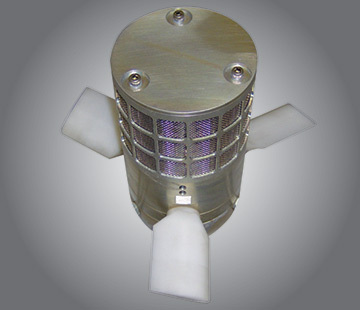 As water filters out the mesh screen of the Gyratory Atomizing Nozzle, turbine force wind pulverizes it and projects uniform micron size droplets to create an atomized vapor wall capable of controlling dust and odor. A Buffalo Turbine Dust Controller featuring the revolutionary Buffalo Turbine Gyratory Atomizing Nozzle can effectively replace and reduce the operating cost of a similar machine that uses multiple spray nozzles tips. Effective with common 3/4″ garden hose connection and standard municipal water pressure. Single removable mesh screen easily cleaned in 10 minutes or less. Change spray direction with remote 360 degree nozzle control for non-electric models. Uses the legendary Buffalo Turbine blower. Manufacturer of turbine driven mist sprayers since 1945. Multiple nozzle tips, each with a tiny hole which can become clogged easily. Time consuming to clean and costly to replace. Adds cost and maintenance. Water volume limited by the size of the tiny hole in each nozzle. Requires inventory of additional nozzles and installation to specific job requirements or ownership of multiple units. Adds cost and maintenance.